Lake House at Hidden Valley Yurts01600 860723work Self-cateringWelcome to our new luxury self-catering holiday home. Surrounded by beautiful countryside, with a large deck overlooking a private lake, a stream running alongside and woodland behind, The Lake House is a peaceful retreat for those looking to get back to nature without leaving modern conveniences behind. • Inside you will find everything you expect from a modern house, including large comfortable beds, modern bathrooms, a well equipped kitchen and a spacious living and dining area. • Outside a covered veranda running the full length of the building leads onto a huge double-deck allowing for sunbathing, BBQs and stargazing. The views are simply breathtaking, surrounded by our 80 acres of woodland and meadow and that serene lake next to it. 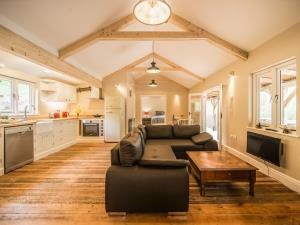 Welcome to our new luxury self-catering holiday home. Surrounded by beautiful countryside, with a large deck overlooking a private lake, a stream running alongside and woodland behind, The Lake House is a peaceful retreat for those looking to get back to nature without leaving modern conveniences behind. Whether you’re looking for a restful break, a family holiday or to explore this stunning region we hope that The Lake House will be your chosen home away from home.